In the warmer breeze and floral aromas that begin in March, many students may begin to feel that spring has arrived. Students visit cafes at the University of Seoul (UOS) to seek relief from the fatigue of spring semester or to chat with their friends. 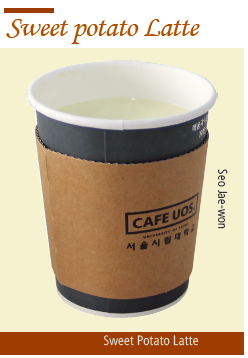 Because of their accessible locations and cheap prices, professors and residents in Jeonnong-dong also visit campus cafes to drink a cup of this beloved beverage. The UOS Times introduces the characteristics of these campus cafes and their newly launched beverages for present and future customers. 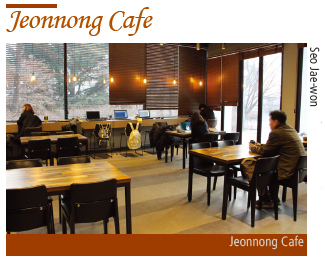 Since it is the cafe closest to the entrance of UOS, more local residents tend to visit Jeonnong Cafe, the easiest place to catch local residents as they sample the coffee. As it is the most recently built among the three cafes at UOS, its interior comparatively cleaner and more modern than the other two places. Its outer wall consists of floor-to-ceiling sliding glass doors so that this cafe enjoys much more sunshine than the other cafes. When the weather turns warm and breezy, the glass wall is open to the air. Meanwhile, inside there are tables attached to the walls with electrical outlets below for personal computers - the largest number of outlets among the three cafes. 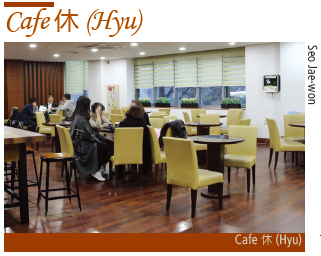 Cafe 休 is located at the Student Hall and it shares space with Annekan cafeteria. Cafe 休 is the only cafe located on the 2nd floor, so students who are near the window can enjoy a wide vista, including the 21st Century Building and the Architecture and Civil Engineering Building. 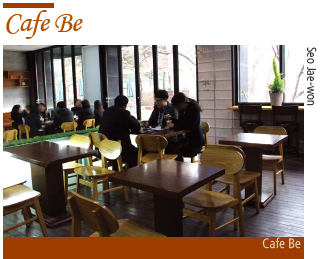 Additionally, since Cafe 休 is close to the other Student Hall facilities such as W.E.B Burger, the central cafeteria, and Annekan, many students usually gather especially after lunch time. 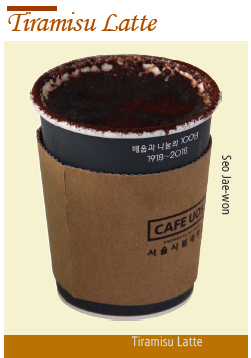 This is the only cafe on campus offering the coffee of the day as both hot and iced, and also unlike the other campus cafes, the coffee of the day is brewed from a bean that is different from that used in the typical Americano. Cafe Be is on the first floor of the Natural Science Building, and because of its location, many professors in the Law School and the 21st Century Building visit. Cafe Be is the only campus cafe that has exterior seating with parasols, making it a good place to have a beverage while enjoying the sunshine and breeze. In addition, Cafe Be is the only place offering a Strawberry Smoothie. Considering that this smoothie is both unique and cheaper than smoothies at the other cafes, students should try Cafe Be’s Strawberry Smoothie at least once. Now that The UOS Times have visited the three best cafes on campus, let us try two new drinks being introduced this semester: the Tiramisu Latte and the Sweet Potato Latte. Both of these beverages are only served hot. How do they fare on the palates of two typical UOS students? When we received our Tiramisu Latte, we were surprised by the ground coffee powder on top. We found the first sip to be a bit awkward as the powder left a bitter, dry taste inside the mouth. Stirring the powder in with a straw improved the taste a bit, but the powder and the coffee left a disharmony on the tongue. On the other hand, if the powder is not included, it will taste rather like Cafe Mocha with ground Tiramisu Cake mixed in. To students who are bored with Cafe Mocha and White Cafe Mocha, Tiramisu Latte may be an alternative. That is, its unique taste is impressive, but too much powder for decoration may distract drinkers from the deeper taste of the whole beverage. Tiramisu Latte reminds me of Cookies and Cream Ice Cream. I would say this beverage doesn’t quite live up to its name, “Tiramisu Latte,” because the taste of the coffee is more intense than taste of Tiramisu. On the other hand, it is not such a sweet drink, so we might recommend Tiramisu Latte to beginning coffee drinkers who are not accustomed to Americano. The powder on the latte is a nice idea, but the aftertaste is not refreshing to someone whose mouth which is more accustomed to convenience-store coffee. Additionally, I cannot taste much difference between Tiramisu Latte and Cafe Latte. Students who like Tiramisu Cake or sweet coffee may be disappointed with Tiramisu Latte. Sweet Potato Latte?a non-coffee beverage?resembles thick milk in both taste and texture, and its first taste was nothing special at all. On the other hand, the cup is warm and soothing to hold, and the sweet aroma brings relaxation. After sipping Sweet Potato Latte, it tastes chopped sweet potato particles rolling through the mouth. The sweet latte and moist sweet potato suit each other well. The proportion of sweet potato is rather small, but considering that its price is 2,500 KRW, which is cheaper than sweet potato lattes at cafes outside campus, this proportion is reasonable. As time passes, sweet potato settles to the bottom of cup, so we recommend using a straw to stir it from time to time. Because Sweet Potato Latte does not contain coffee, this one will be a good choice for readers who want to drink latte without caffeine. Sweet potato Latte looks like just milk, and the smell and taste are similar to sweet potato flavored snacks. The more Sweet Potato Latte I drink, the more enchanted I become with its particular flavor. I recommend Sweet Potato Latte to fourth-year students who would like to break their addiction to caffeine, but who would like to relax a bit from worrying about getting a job. The unexpected, soft, sweet taste and smell of sweet potato is the identity of Sweet Potato Latte. It has the ordinary texture of food. I would like to recommend this drink to students who love sweet things and sweet potato. Cafes have long been very close to UOS students, and they are a nice part of the UOS experience. They have provided tasty coffee and tried to improve their interiors, while launching new coffees. We can expect more development in these pleasant spaces in the future.